The following is the first annual report ever released publicly by the Vatican Bank, officially known as the Istituto per le Opere di Religione (IOR). The report was first drafted in March 2013 but was only recently released to the public at the beginning of October. The Cardinals’ Commission welcomes the publication of the first Annual Report of the Istituto per le Opere di Religione (IOR). Since the first Vatican City State law on anti-money laundering (AML) came into force on 1 April 2011, the IOR has embarked on a course of reform, of which transparency is a key element. The reform process led to the appointment of the Pontifical Commission by the Holy Father on 24 June 2013, and will result in giving the IOR a new direction, as was done in 1942 and in 1990. It is important to remember that the IOR’s reason for existing is to serve the Catholic Church, in particular its works of charity and its missionary activities, by safeguarding assets and providing payment services. 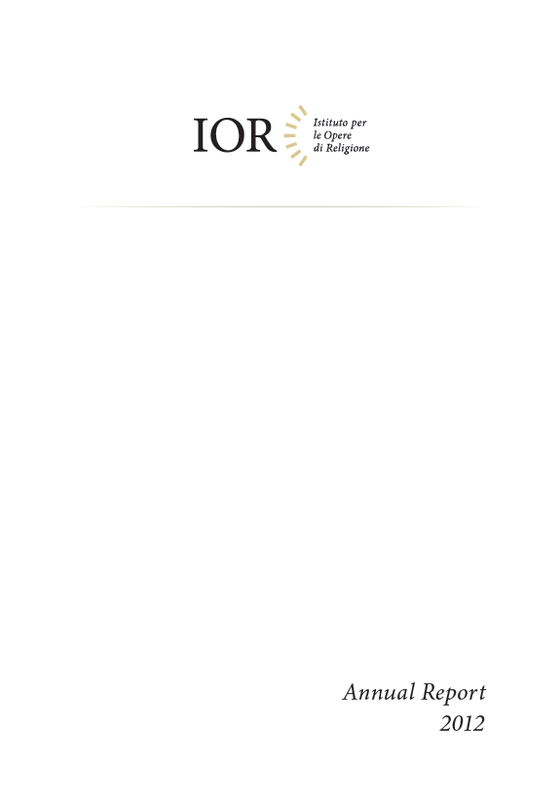 The IOR strives to serve the global mission of the Catholic Church by protecting and growing the patrimony of and providing payment services to the Holy See and related entities, religious orders, other Catholic institutions, clergy, employees of the Holy See and the accredited diplomatic corps. The IOR is situated exclusively on the sovereign territory of the Vatican City State. The IOR is supervised and regulated by the “Autorità di Informazione Finanziaria” (AIF), the financial and regulatory body for the Vatican City State and the Holy See. The IOR serves the global mission of the Catholic Church by safeguarding assets. It offers deposit taking, asset management, custodial functions and international payment transfers through correspondent banks, and holds salary and pension accounts of employees of the Holy See and Vatican City State. It protects its customers’deposits and assets by investing predominantly in fixed interest securities, government bonds and money market accounts. Less than five percent of total assets are held in externally managed funds and equities. In only very few, exceptional cases the IOR lends money. The IOR does not issue, underwrite or place securities. According to the requirements of Vatican City State Law and international inter-bank payment systems, IOR accounts are held in the name of the respective customer. There are no anonymous accounts. Customers are provided with services in our office in the Vatican City State. We do not have other locations and do not offer any internet-based services. 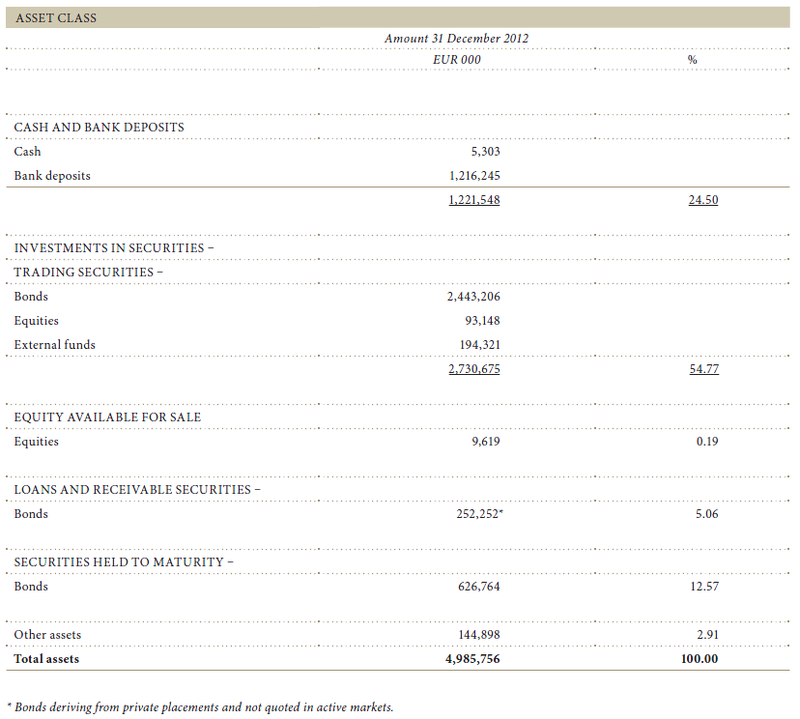 As of the end of 2012, the IOR had approximately 18,900 customers, of which the vast majority, measured by assets under management, were institutional. The IOR’s customers have one common denominator: they are part of and serve the Catholic Church. In line with our Statutes, the IOR provides services only to legal and natural persons with an affiliation to the Catholic Church as defined by Canonical or Vatican City State Law. The most important group by assets are religious orders, which accounted for half of our customers in 2012, followed by Holy See Offices and nunciatures (15 %), cardinals, bishops and clergy (13 %), dioceses (9 %), and the rest split between various others, including employees and institutes of religious education. The IOR does not accept individuals without a relationship to the Holy See as customers, nor does it accept business customers. In many cases our customers are active in the mission or perform charitable works at institutions such as schools, hospitals or refugee camps. Other customers serve, or are part of, the institutional aspect of the Catholic Church, such as dioceses, the Clergy or Vatican City State employees. Last but not least we serve two sovereign customers, both having the Holy Father as their head of State: The Holy See is the supreme institution of the Catholic Church and maintains diplomatic relations with 192 states and more than 20 supranational organisations. The Vatican City State, meanwhile, serves as the seat of the Holy See and a number of central institutions of the Catholic Church. It is in the nature of the Catholic Church that its institutions, missionary activities and charitable works reach out into parts of the world that are remote, and have very basic infrastructure, often including an underdeveloped banking and payments system. For these customers, the IOR is particularly important as a trusted, reliable and effective institution, keeping funds safe for future use or sending funds through correspondent banks to the countries in which they operate. Our customers are frequently present in different countries, using different local currencies. Here, too, the IOR can help safely transfer funds from one part of the world to another. Our customers tell us that this trusted relationship is very valuable to them, especially in times of political upheaval and financial instability. Our customers also know that their money is invested responsibly and ethically.